Deloitte employee Manal Rhimy demonstrates a virtual reality application used by one of Deloitte's mining clients to train workers before they arrive on site. Deloitte Canada’s newest office is bold, unorthodox, stylish, attractive, and tech-driven – everything you’d expect from a group of accountants working at a 158-year-old firm, Toronto managing partner Ryan Brain jokes. And yet it’s undeniable that the venerable advisory firm’s new Toronto headquarters embrace, as Brain put it, a startup mentality, with an emphasis on mobile technology, remote access, collaboration, and perks such as a concierge-like help desk, meditation space, and exercise room rather than competition for a corner office. We could have built a slideshow from the perks, which include not only an exercise room and “D.411” help desk, but Starbucks coffee, soundproof booths, and even a prayer room. 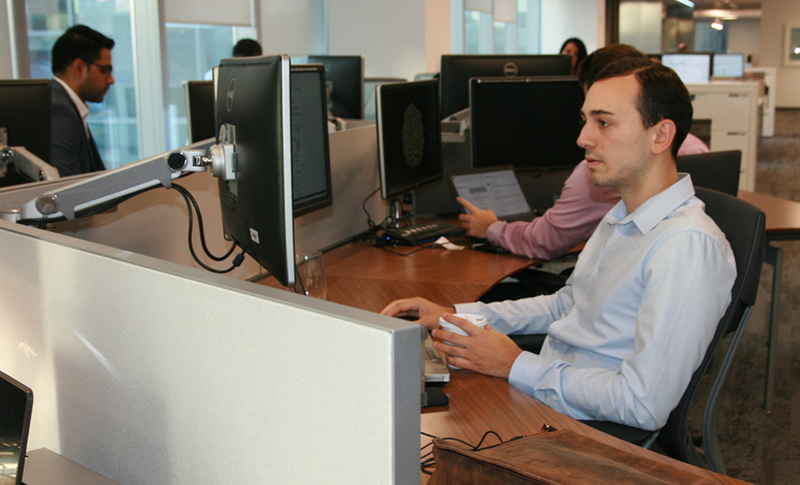 Central to the new Toronto office’s tech-savvy approach is the ease with which employees can move from one room to another, with monitors and plugs available for their laptops at any work station on any floor. Between the large-screen monitors and adjustable chairs, individual offices are hardly missed. Smart boards and touchscreens also play a role; accessible from many collaborative spaces, they’re frequently use to communicate with clients across the city and around the world, Brain says, with employees easily moving from one screen to another. There were six screens in this room alone, with the above presentation using two of them. 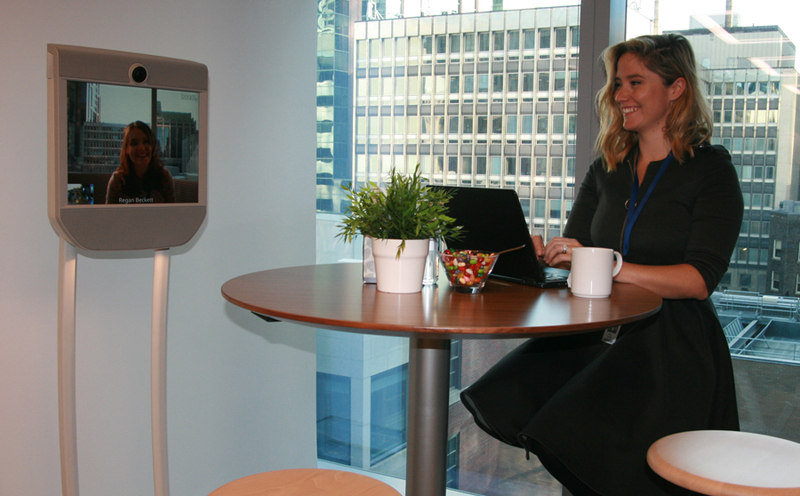 Another popular collaboration tool is the company’s collection of Cisco-like robots, he says, which can easily be moved from one office space to another, enabling personal communication across floors and international borders alike with equal ease. This particular robot is letting coworkers chat from opposite ends of a building. The reason for Deloitte Canada’s remastered approach, naturally enough, was employee engagement, managing partner and chief executive Frank Vettese told ITBusiness.ca, with the company conducting research over a period of many years to determine the “ideal” workplace for innovation and productivity. In the end, they concluded there wasn’t one. 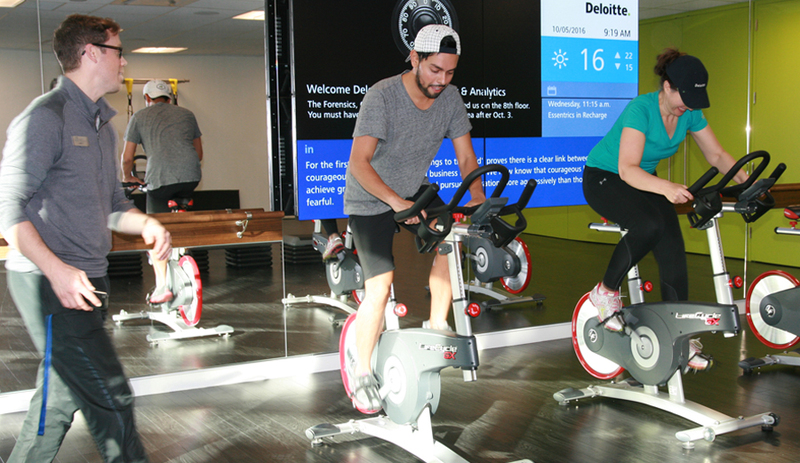 Many of the ideas implemented as a result have no technological component: For example, while the average office has three types of workstations, Deloitte’s new Toronto headquarters has 18, managing partner Brain said. And while traditional offices dedicate only about five per cent of their floor space to collaboration, Deloitte’s Toronto office dedicates around 65 per cent. Another unexpected boost was the impact of added windows: 90 per cent of the Toronto office has access to natural light, Brain said. Yet there was never any question that technology would play a role in Deloitte’s future offices, CEO Vettese said: prior to his current position, he played a leading role in setting up the Canadian arm’s analytics team, and knew firsthand the value of creating a platform designed to constantly evolve. 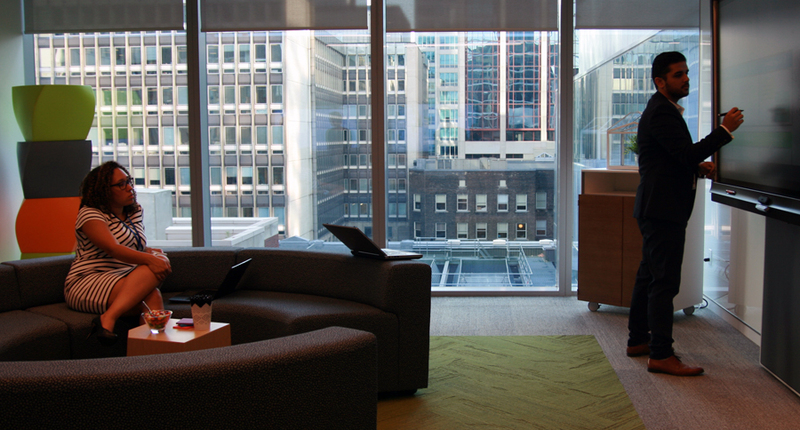 In fact, the Toronto office isn’t even the first Deloitte building to embrace the twin spirits of collaboration and technology, he said: it’s the sixth, with offices in St. John’s; Sherbrooke, Quebec; Ottawa; Langley, B.C. ; and Montreal preceding it, with employees at each providing feedback on the next one. It’s made a difference, both executives said, with Brain noting that studies suggest Deloitte’s new approach may boost productivity by up to 25 per cent.